So, when I get into something, I really get into it. 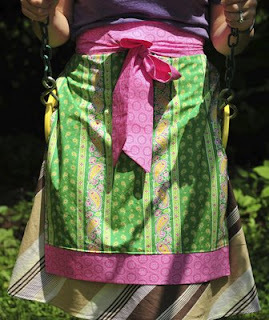 I started out making two more of Jona's "Apron in an Hour" from the free PDF on her blog/fabric website Fabritopia. I'm spreading the fabric love around though, because the fabric came from Close to Home in Glastonbury, CT (super nice staff) for the pink and green preppy one, and Lisa's Clover Hill Quilts in Berlin, CT for the mum and purple one. I had gone to both shops to check out how close they are to me, because they're both participating in the 2009 CT Shop Hop (my first one!). I figured it would be good to scope places out before I had to visit all 18 in such a short time. I'm really looking forward to it! The last one is for my dear friend/coworker Kari (you can follow her on Twitter at @KPlavcan13), for a belated birthday gift. She is a talented cupcaker extraordinaire, and I figured she needed a cup-cakey apron for when she's working her magical goodness. 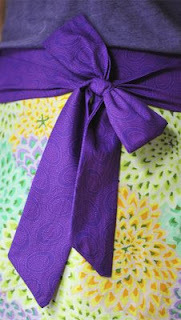 The pattern for this came from Bari J, an amazing and talented fabric designer. 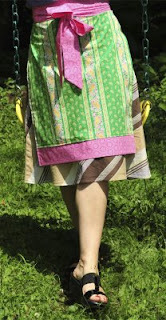 Her pattern has great tips, and I can assure you, I needed all of them! The fabric is a very cool mix of Joel Dewberry Aviary (pink) and some of Project Runway Season 1 winner Jay Carroll's Woodland Wonderland fabric line. I'm getting much better with my new machine, and I'm looking forward to making some more actual garments. 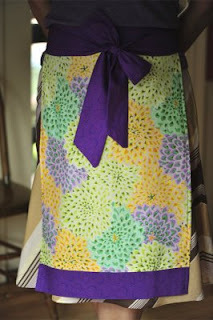 I made a skirt this week that came out just god-awful. So bad, there's no pictures!